The number of children assessed as homeless in Scotland has risen to almost 16,000, it has emerged. 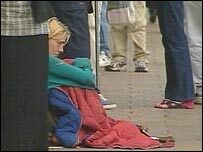 Figures showed there were 15,919 children in homeless households in 2004-05 - up from 15,689 the previous year and 14,807 in 2002-03. The Scottish National Party said the Scottish Executive was failing the country's most vulnerable families. The executive said it was working with others to deliver "Scotland's ambitious approach to tackling homelessness". The figures were provided by Communities Minister Malcolm Chisholm in response to a parliamentary question by Stewart Maxwell MSP. They revealed that a total of 9,395 households with children were assessed as homeless by Scottish councils in 2004-05, compared to 8,994 in the previous year. Mr Maxwell, SNP deputy health spokesman, said the executive was failing in its pledge to end homelessness. He said: "Instead of seeing the decline and eradication of homelessness in Scotland, we are seeing a year-on-year rise. "The reality for many thousands of children across Scotland this year is that they will have a homeless Christmas, rather than a happy Christmas. "After six years in power, members of the Lib-Lab government have no-one to blame for this abject failure to protect vulnerable families but themselves." However, an executive spokeswoman said: "The Scottish Executive is committed to delivering, by 2012, a permanent home for those found to be unintentionally homeless. "We have always acknowledged how challenging and ambitious Scotland's progressive approach to tackling homelessness is and local authorities, housing associations, voluntary organisations, health bodies and many others are working with us to meet this challenge." A spokeswoman for Shelter Scotland, a housing and homelessness charity, said it was unacceptable that vulnerable families were homeless in the 21st century. She added: "Homelessness has an impact on various aspects of their life, including missing out on school, play and the opportunity to develop. "But we shouldn't use this as an opportunity to berate the 2012 target on ending homelessness. "We should be talking about how we reach that target - not about if we do."